Those fuzzy slippers I knitted and felted for my Jellybean? He was sitting RIGHT THERE while I was felting them, too. I tried to try them on him, but I can’t blame him for not wanting wet wool put on his feet. Maybe he just grew out of them in the three days it took for them to dry?? Meanwhile, planning for the new sweater is in progress. Last year’s coat was made just off the cuff. (ha ha.) 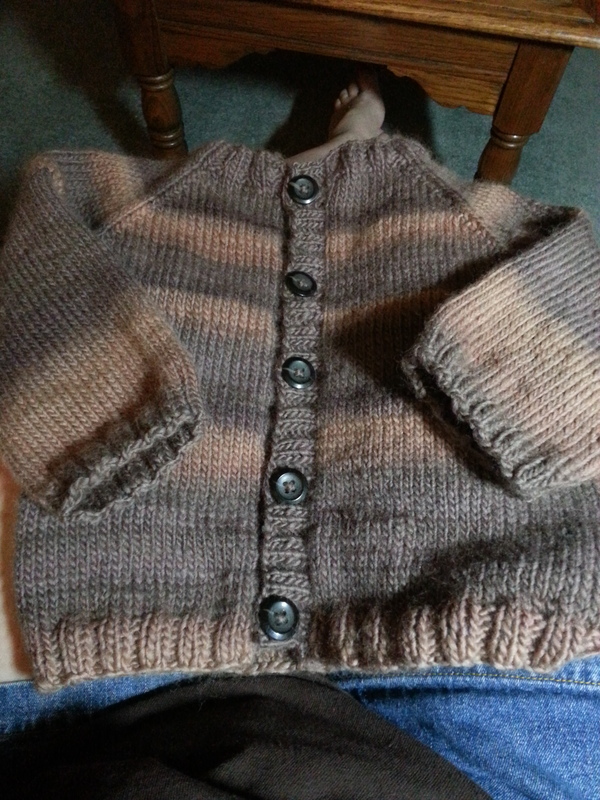 I cast on some stitches, did some raglan increases, put the sleeves on stitch holders, knitted the body, came back and knitted the sleeves, then did the button band. It was so easy…. and such a wrong size in the wrong yarn. I also made it in May, so there was no pressure to make it fast. Even with all the issues, last year’s sweater has been very well loved. The poor thing looks like a sheep, now. It’s fuzzy, pilled and felted in places. The neck has stretched out and felted in place so it looks more like a boat neck sweater than a crew neck cardigan, but at least that makes the sleeves seem longer. It doesn’t even bother me that it’s in such rough shape. It was meant to be used, and it’s definitely served it’s purpose. I used a single-ply, worsted weight wool and that’s why it pilled and fuzzed up so badly and so quickly. I read about single ply not being good for heard-wearing garments shortly after I finished the sweater… of course it was too late, then. 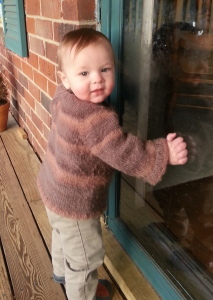 Jellybean is still wearing last year’s sweater because it’s what we’ve got, and it’s cold. I’ve been several places that I could have bought a new coat for this winter, but in the back of my mind I keep thinking, “Oh, we don’t need to buy one because I’m going to make one.” HELLO, MAMA! It’s November, temperatures are below freezing on a regular basis now. If you’re going to make it, get on it! Well, I am, but I want it to go a little better this time around. Last night, I swatched (don’t look at me like that…. gauge is important here) and today I washed and blocked the swatches. I am waiting for them to dry to see which I like, but I may have to do another swatch, because I don’t think I’m going to hit the gauge I was aiming for (4 sts per inch, in case you’re wondering). 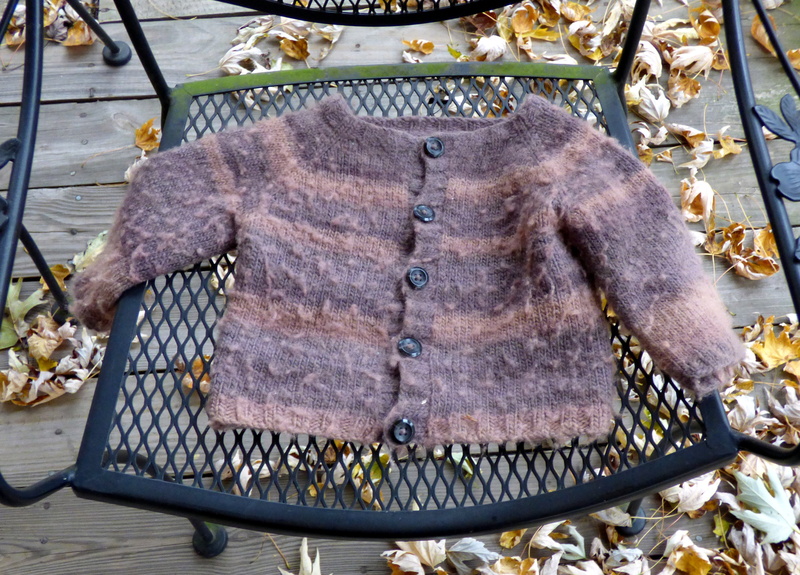 I’m planning to use Wool of the Andes Tweed for this sweater. I had ordered the Autumn Heather colorway, but it’s redder in person than it looks on the website and he already gets called a girl. I’m trying to decide between the Prussian Heather or the Flagstone Heather now. For the pattern, I’ll be using instructions from The Knitter’s Handy Book of Sweater Patterns by Ann Budd. I plan on a crew neck cardigan with raglan increases (again) but this time with a better starting point. Which I should probably start thinking about. Today is supposed to be the last nice day. Tomorrow, the rain comes, and with it much lower temperatures. It’s time to break out all the cozy hand-knits. Oh, who am I kidding, I did that back in September! My son seems to be much like his father, though. I put socks on him, because his toes are cold and 30 minutes later, he’s all, “Mama, help!” and “Socks off!” I can wear my felted slippers pretty much all day and still have ice cold toes at night. It must be nice to always have warm feet! 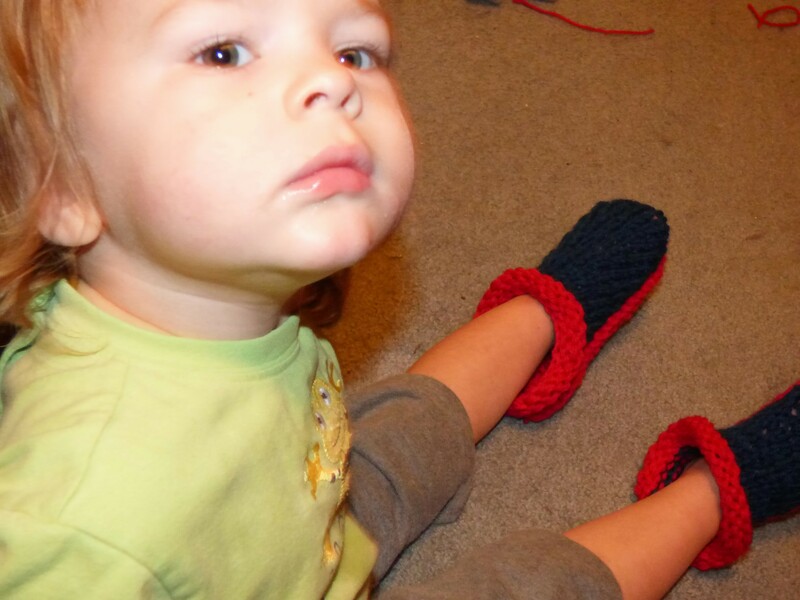 Even though he doesn’t want to wear socks for long, I still made him a small pair of felted slippers, like I said I was going to. I hope he gets some wear out of them, especially since the coldest weather is still ahead of us. This photo is of pre-felted slippers. I felted them on Saturday and they’re just now dry. When Jellybean wakes up from nap, I’ll see if I can get him to wear them long enough for an action shot. I finished my last commissioned project for Christmas 2014 last week and I’ve settled in working on the knitting for my gift list. I have one project finished already – I finished that one back in July and I’m proud to have been thinking ahead like that! 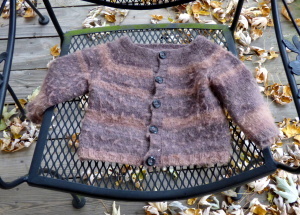 I’m hoping to also squeeze in a little jacket for Jellybean. He’s wearing the one I made him last year, and it still mostly fits since I made it really big last year, but it’s getting pilly and felted from drool, so I want to do another. With the cold weather coming up, I may focus on that first. Well, I’m off to do some of that knitting I need to do. Have a great week!